The complex, rolling hill country between Glasgow and Stirling is a wild, stirring place to ride. It's one group of hills made up of the Strathblane, Gargunnock, Campsie and Kilsyth Hills, numerous other names, and therefore rich country for the pedant; we'll just call them the Campsies here. The range isn't quite as desolate as it looks from say Strathblane - for all it looks like no-one could be alive up there, the range is actually surrounded and studded by villages and small settlements. Most of these are very pretty. A long circular ride, or a north-south traverse between Glasgow and Stirling or somewhere in the Trossachs, are my favourite ways to ride here. 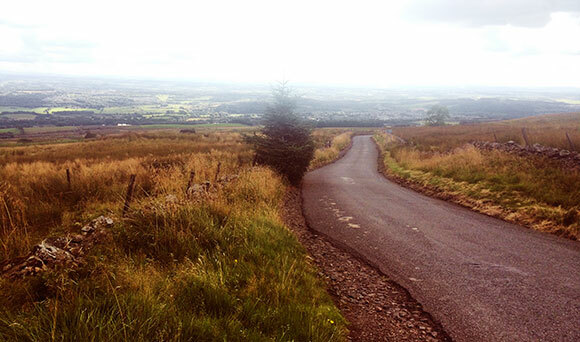 Riders who can get off tarmac are spoiled for choice of routes in the Campsies. Trails abound in the hills, you can climb from the southern or northern side, and you can - with a bit of effort - also take a mountain bike right across the range east to west. It's often difficult but rewarding; these are rounded, rolling hills with sometimes indistinct and boggy paths, and navigation off the road in bad weather can be difficult. Great mountain biking adventures are possible. But the jewels in the crown of the Campsie range are the famous old hill roads that cross it, and two in particular: the Crow Road, and Tak ma Doon. 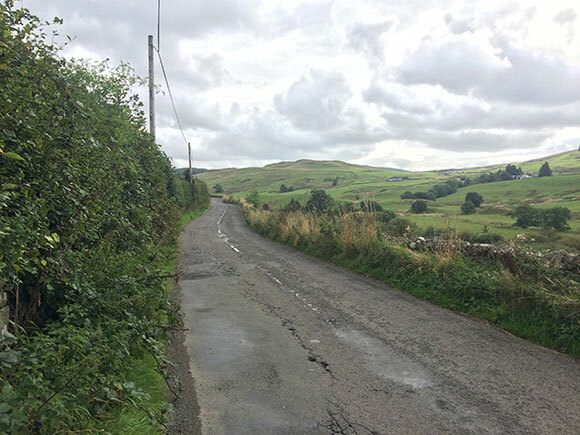 The Crow Road is an infinitely steep and long climb out of Lennoxtown across the south face of the Campsie range, with a drop on the north side even steeper and longer, down to Fintry. The road goes over the remote centre of the range; this route takes it south to north, but it's not a straight up-and-down ride. The summit is broad and very rounded at this point and there are no views from the top. The best view point is the car park you pass where the road swings northeast, about 3km from Lennoxtown, even though at this point you are less than half way up. Over the top this route descends to Fintry then turns west and rounds the Campsie range, passing through the villages of Killearn and Blanefield, to return to Glasgow at Anniesland. 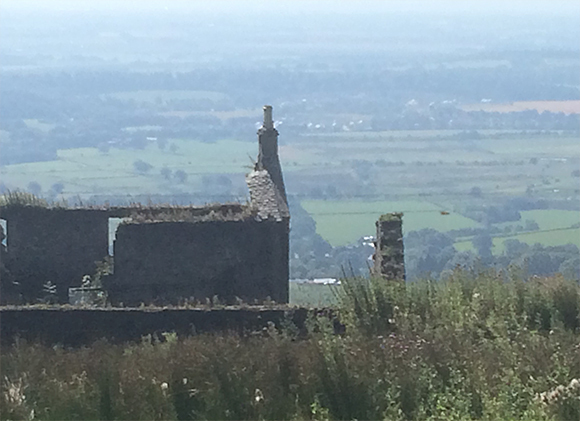 The rugged northeastern part of the Campsies is more accessible from Stirling than Glasgow. 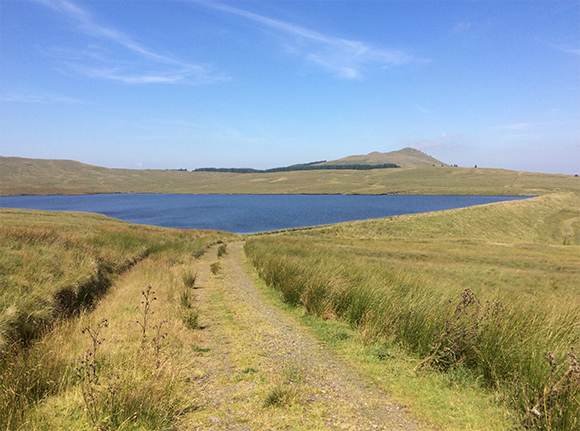 A great day out on the bike for riders based near Glasgow is to take a train to Stirling and ride over the Campsies via Carron Valley Reservoir, an artificial reservoir - basically a gigantic flooded field around the old River Carron. 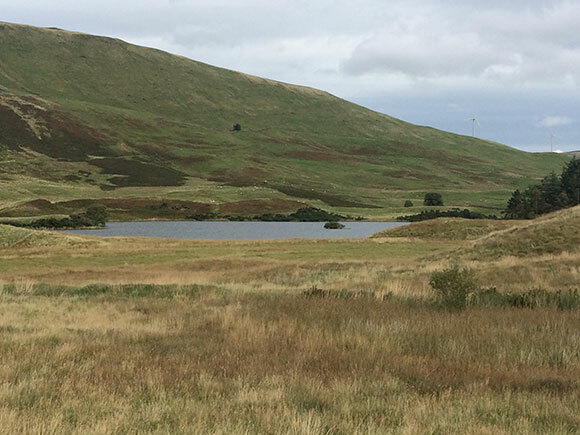 The reservoir was created by a dam at the eastern end, at the small settlement of Carron Bridge, and a smaller dyke at the other end to shore up the boggy western end. Like many of the reservoir projects in this area, the dam was built just before World War 2. It has turned into an absolutely beautiful loch, offering an exquisite ride along the road on its north shore. For those on fat tires there's a new MTB trail park on the southeast side (entrance by the dam) - the trails go up and around the north face of the Campsies main ridge. Perfect backcountry riding; a nameless, sort-of surfaced road in deserted hill country. Photo taken facing west just after crossing Earl's Burn on the mapped route. The mapped route also passes the now-disused North Third reservoir farther east (also very pretty), before traversing Carron reservoir west - east to the dam at Carron Bridge. From there head due south onto the Tak Ma Doon road for a short climb up out of the valley, then a screaming descent down to Kilsyth. A stop about a quarter of the way down the hill to visit the car park / viewing area on the left (east) as you descend is well worth it; the views down the Forth from here, if you can see it for the mist/rain/sleet/snow, are great. At Kilsyth there are few reasons to dwell. Take Burngreen and Howe roads to give you the direct route through to the Forth-Clyde canal path (labeled on Google Maps as NCR754). You can follow the canal towpath all the way to Anniesland; there are even a couple of pubs on it, including the very nice Stables about halfway between Kirkintilloch and Torrance. 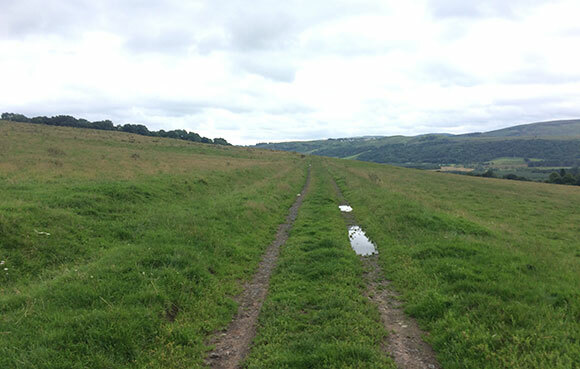 The path runs down the north (right) bank as far as Maryhill, then the south (left) bank from there on. Use the underpass at Lochburn Road to make the change, where the canal splits at Springfield junction. This route heads north from Anniesland to Strathblane and uses the excellent Campsie Dene to avoid the nasty A81 main road and cut off a large corner on the way to Killearn. Ten minutes on the road, then east out of Balfron, skirting the north edge of the Gargunnock hills, before heading northeast along the excellent - if somewhat potholed - Boquhan burn road, an open secret among cyclists based around here. It's a gated road that runs from Balfron to Inch-of-Leckie, avoiding the sometimes-busy B822 road (there are a couple of short sections where you do have to jump onto the B822). The route runs right under the lava cliffs of the Fintry hills and is perfect backroad cycling; the gates mean no cars. A road bike will do you on the Balfron to Stirling section of this run, but it is pretty bumpy and the mapped route does use some... shortcuts. A gravel or cyclocross bike, or a road bike with the tyres let down a little, would be the best option. Dodo had only an XC bike available, so pumped the tyres up and went screaming along on that. I can't see a road bike coping with Campsie Dene, but you can easily turn that and just use the road. Get to Strathblane village as you prefer; the mapped route uses the main roads from Anniesland, then Old Mugdock Road down to the village. 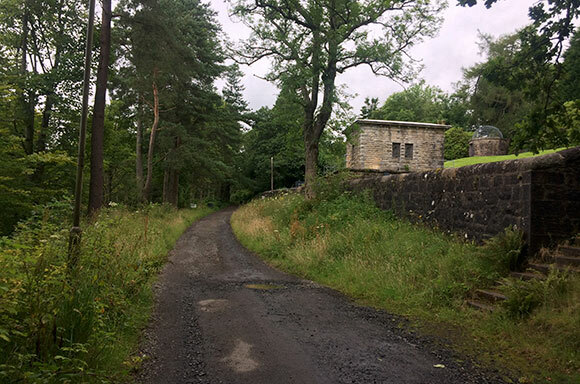 Turn west onto the main road and then right onto Campsie Dene (the start of this road is technically in Blanefield village). It's a gentle climb on tarseal for a short distance to the church, then it's gravel round the backs of various farms and the Glengoyne Distillery. Campsie Dene is much higher than the road, so the views are excellent. Keep trending north and don't take any of the westward-pointing side tracks which just run down to the road (they're all pretty steep and obvious). Occasional giant gubbins will appear on both sides of the road - these are to do with a water pipeline that runs along the line of the road (sometimes directly under it) from Loch Katrine to Mugdock. 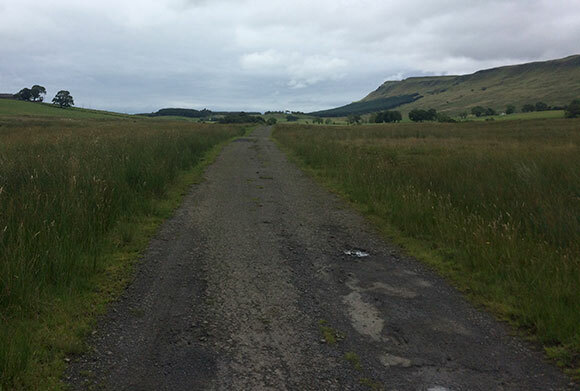 When you get to the end of Campsie Dene, dirt roads bend away to the right (uphill toward Dumgoyne) and left (downhill to the farm and the main road) but a track continues straight across the field in front of you to Killearn village. Take it, boggy as it may be, keep going past the houses and stay on the track when it goes into the forest and emerges onto an estate road (the houses up here are lovely). Follow the estate road round to Ibert Road, turn left onto it, ride down to the main road and turn right. Ride up through Killearn and I recommend a stop at the Old Mill for coffee (doesn't seem to open till noon though). Then storm through the village toward Balfron on the main road, through Boquhan One (there are two Boquhans, several kilometres apart). The road is fast, but mostly downhill. Turn right in Balfron onto Dunmore Street which is the start of Boquhan Road. It mostly looks like this. Middle section of Boquhan Road. 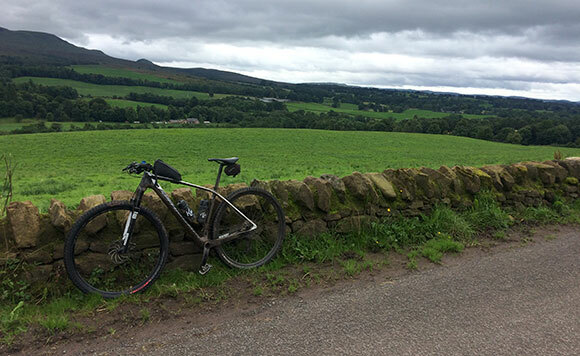 From Balfron it's 16 kilometres of delightful backcountry riding with the Campsies, basically a large lava flow, on your right over a mix of farmland and moor. You will cross the B822 at the magnificently-named Balafark, and pass various farms and properties before arriving at Boquhan Two, which is announced by the old mill at Leckie. The road sweeps left and downhill, and you should turn right here or you will end up on the main road. A sign from the Scottish Rights of Way Society (bless them) points to Gargunnock, but this sign is under trees on the left side of the road and you can't see it until past it. Make the turn and follow the new track for a short distance until you see the following excellent sign. 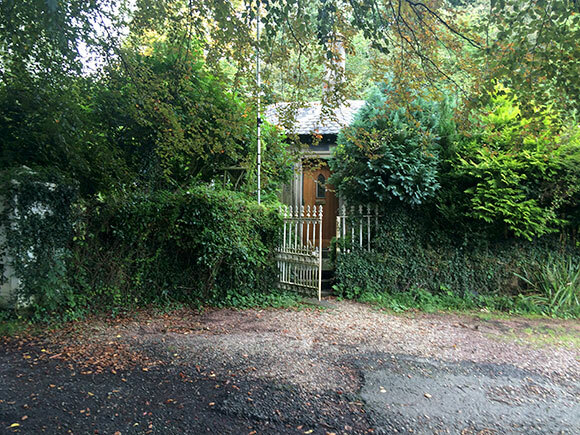 If you go straight on down the track (as Dodo did), you get a great view of a rather stunning country house followed by a muddy, overgrown track down to the western end of Leckie Road; if you go the other way it's a more civilised gravel road ending at the same place. Head off east down the road to Gargunnock, ride through the village and fight your way as far east as you be bothered on the tracks before jumping onto the adjacent A811 for a short distance. Take the right turn up to Touch and Cambusbarron, and ride down to Stirling from there. The route goes down through Kings Park; if you must live in Stirling, choose this part. The Campsie range is full of water projects lurking in various depressions. Birkenburn reservoir is a stiff climb from Queenzieburn, mapped here starting from Twechar. Ride north up Mill Road from Queenzieburn and continue onto Dykehead road, uphill away from the houses. This is a delightful climb on tarmac with the burn beside you. 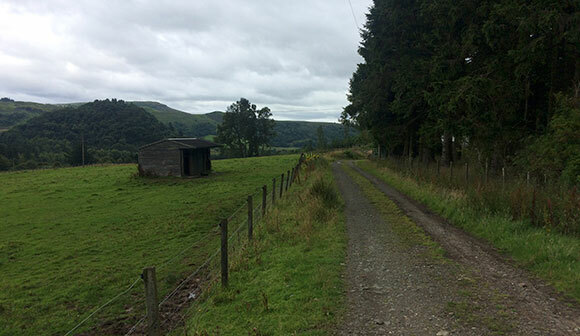 After crossing the burn and passing the farms, cross the road (Whin Loan) and go straight through or over the gate leading to another direct climb uphill on gravel. Follow the road where it turns right in of another farm, and where it forks 50m later, take the left track going directly uphill behind the stone barn. 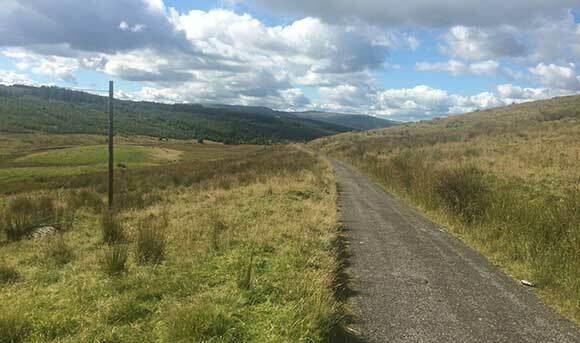 Ride, walk or stagger up this steep track as best you can until it eventually levels off on the shoulder of the Campsie main ridge, and ride on to Birkenburn. Looking back south from the hill track at the last farm buildings. Yes, incredibly, that's a heat haze in the valley. Approaching Birkenburn reservoir, with Meikle Bin in the background. The reservoir itself is a slightly bizarre looking thing, basically another flooded lawn, this time with just a dkye at one end and the outlet for the Birken burn. It's actually quite hard to see the whole thing without climbing the nearby Meikle Bin. Dodo went up there on a rare hot day, where the sun was fierce, so this was out of the question. The powder blue of the water against the pastel green of the wild grass and the blue and white of the sky, with a lilac dusting of heather, like a Glaswegian's summer attire. 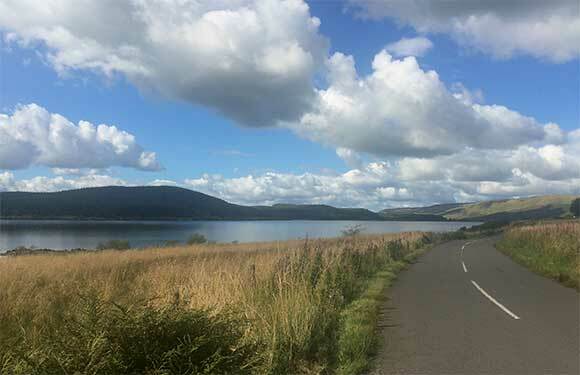 This route uses sections of the routes described above, with only one difference - it uses the Fintry - Carron Bridge section of the B818 road which runs along the north shore of the reservoir for part of the way. This road is one of the prettiest in this part of the country, although the first few kilometres of it climbing out of Fintry to Loch Walton are badly in need of resurfacing. Judging by the number of bikes I passed the day I did this ride, it must be one of the most popular rides for people based in either Glasgow or Stirling. Fintry to Denny section of the B818, climbing out of Fintry toward Loch Carron. Like cobblestones. Main photo: Carron valley reservoir. Like Loch Lomond, but much, much quieter. It's a DIY version, they made it themselves. But look how it's turned out. Don't tell anybody where it is.